Beautiful example with Dan Moto exhaust, and factory race ECU. From the time it appeared on the scene, it was clear to all its rivals that the Aprilia RSV4 was the bike to beat. Unmistakable in its design lucidity and applied technology, the RSV4 is conceived around a 65° V4 engine never before seen on a factory sport bike, a frame which is the heir to a dynasty that has won 18 titles and 143 Grand Prix races in the 250 GP class, enhanced by the most advanced applied electronics systems to manage the engine and the bike's dynamic performance. This is a true vocation of Aprilia, which was the first manufacturer to adopt the Ride-By-Wire system as standard equipment (the multi-map power management system), but above all the first to patent the APRC dynamic control system, still today the only one with the exclusive self-calibration and wheelie control features. This technological first is consolidated today with the 2013 range: Aprilia RSV4 R ABS and Factory ABS are the models which, for the quantity and quality of new content and improvements, undoubtedly represent the most important advancements ever made on this extraordinary model. The close derivation of the Aprilia RSV4 R ABS and Factory ABS models from the racing world can be clearly seen in the engine specifications, the first high performance mass production narrow V4 in the world, the most revolutionary and powerful engine ever built by Aprilia. This is an engine which is made unique and unmistakable thanks to the use of "total" electronics, thanks to its record light weight and extremely compact size. 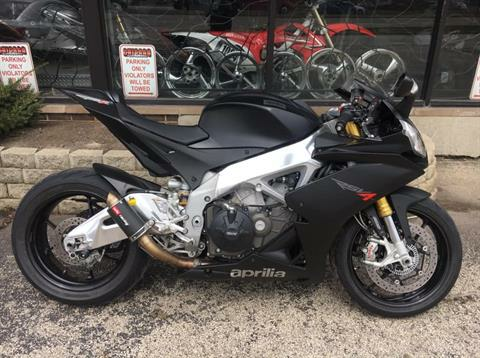 The engine in the new RSV4 MY 2013 bikes has been upgraded and improved with particular attention given to reducing internal friction and casing ventilation. This brings the maximum power of the 65° V4 to 184 hp, with torque now arriving at 117 Nm, also due to a redesigned exhaust system and fine tuned electronic management. The 3 distinct mappings (Track, Sport and Road), were matched to the new power and torque specifications of the V4 in order to obtain even more full and rich power output at any engine speed. With the goal of improving the already exceptional deceleration capacity of the RSV4, the new Aprilia RSV4 R ABS and Factory ABS models have a brand new front braking system, which is dressed up with refined Brembo M430 radial mounted monoblock calipers and the new radial master cylinder on the handlebar. The rear brake caliper was replaced with a more advanced and more efficient one, perfecting the combination with the new front brake. In the braking phase, as delicate as it is important, optimum weight distribution is fundamental: for this purpose the RSV4 ABS engine benefits from different positioning within the frame. On the new RSV4 R ABS and Factory ABS MY 2013 bikes, the APRC system has been further developed and refined in order to adapt even better to the specific needs of enthusiasts on the street and professional riders on the track. Now the behavior of the system is even more uniform, guaranteeing a high level of support in turns and high speed without penalizing traction coming out of slow turns. The new APRC system integrates even better with the electronic full Ride-by-Wire multi-map management of the powerful V4 engine. For the R version new graphics are provided, an aggressive Matte Black that enhances its technical nature. Level 3 Rain: Dedicated to riding on surfaces with poor grip, it acts on both wheels and is combined with the advanced tip over system. The most evident aesthetic change has to do with the new fuel tank, which has been modified not only to facilitate placement of the ABS control unit, but also to increase riding range and to improve rider ergonomics: in fact, the total capacity went from 17 to 18.5 liters, while the side panels introduce lines which increase the rider's feeling during braking and in turns. This solution was borrowed directly from the Aprilia RSV4 used in the World Superbike championship. Level 1 Track: Dedicated to the track (but also approved for street use), it acts on both wheels and guarantees maximum possible performance, even in the most intense braking situations at any speed. This setting takes nothing away from the pleasure and performance of "pushing the envelope". Level 2 Sport: Dedicated to sport riding on the street, it works on both wheels and is combined with an advanced tip over system (RLM - Rear Lift-up Mitigation) which has progressive action based on the vehicle speed. Aprilia forged aluminum alloy, completely processed, 5-split spokesFront: 3.5 x 17 in.Rear: 6 x 17 in.